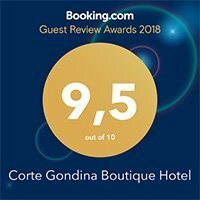 A few kilometers from Alba, the Corte Gondina Hotel is a small boutique hotel with 14 personalized rooms, swimming pool, garden and personal Spa. Elegant and comfortable, it is situated in the centre of La Morra, a small village in the heart of the Langhe, a region famous in all over the world for Barolo wine and gastronomy. In a delightfully private habitat Elena and Bruno have skilfully combined past and present to create a unique experience. The Hotel follows an hospitality philosophy different from the ordinary because it wants to be, for its guests, an out-and-out “home far away from home”. Crossed the gateway of entrance of via Roma, the slow and coocon-like rhythms of the “home” will envelop you, making your holiday in Langa unique and unforgettable.